Maryland Has An Official Holiday Celebrating Which Video Game Franchise? Over the course of the history of Tolkien’s Middle-earth and the saga of the One Ring, more than a few people bore the tremendously powerful artifact. While both the novels and the film adaptations thereof focus on the heroic adventures of a band of hobbits determined to carry the ring back to its place of birth, Mount Doom, the hobbits were not the longest-running bearers of the ring. The longest any single hobbit bore the ring was 478 years, when it was born by Gollum (the hobbit named Sméagol who lived such a long time thanks to the powers of the ring). The second longest span of time the ring was born by a hobbit was 60 years, by Bilbo Baggins, who then in turn passed it on to Frodo Baggins (who bore it for approximately 17.5 years). All of this can’t hold a candle to how long the original ring bearer (and the one responsible for forging the ring) bore it. 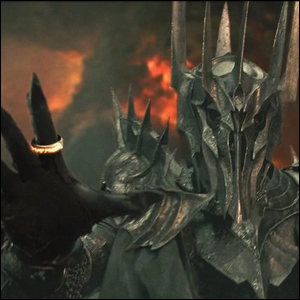 Sauron, the first bearer, controlled the ring for around 1,850 years. In fact, the only span of time longer, in the ring’s history, than the period it was controlled by Sauron is the period in which it was lost. The ring was missing for 2,461 years before it came into the possession of the first of many hobbits (though all the time the hobbits bore the ring combined only adds up to about a third of the time Sauron had possession of it).